When white nationalists, supremacists, neo-Nazis were clashing with counter-protesters and anti-fascists in Charlottesville, armed men in camouflage -- private citizens, part of the New York militia -- were also there. This local militia tells Sarah Wallace they were on guard in Charlottesville to protect lives. Sarah Wallace reports. 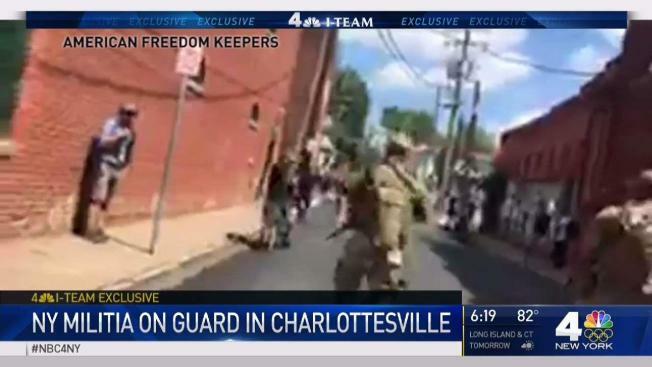 Members of a New York militia group that responded to the violence in Charlottesville earlier this month are speaking out about that chaotic day, the "Patriot" movement and white supremacy in an exclusive interview, their first to air on TV, with NBC 4 New York's I-Team. New York Light Foot militia commander Commander George Curbelo, whose group trains in the Catskill Mountains, told the I-Team he helped lead a team of 32 "patriots" from six states to Virginia as chaos erupted during a White Nationalist rally Aug. 12. "We came as a neutral peacekeeping force,” Curbelo said. He said that his group is a constitutional militia whose role is to preserve First Amendment rights of free speech and assembly, even if the message is hateful. “They had a right to be there, but no right to be violent,” he said. Curbelo said many of his 200-plus members chose not to go to Charlottesville because they worried about the danger and of being linked to white supremacists. The militiamen said they tamped down skirmishes until a right-wing group brought in reinforcements and clashes escalated out of control between the marchers and counter-protesters. “We held back the right and left from full altercation for nearly two hours,” Curbelo said. The militiamen criticized law enforcement for not doing more to keep the peace. “They were not there for crowd control, but riot control,” Curbelo said. Curbelo said at one point, some of his men who had been attacked and threatened were cornered in an alley and had to be “extracted.” They retreated after officers gave orders for the crowd to disperse and were on the way home at the time of the deadly car attack on a young woman. “It was horrible, the hate at that rally,” Curbelo said. "They should stay home,” he added. Curbelo said that’s not going to happen, claiming the group has plans to send men to Washington, D.C. for a rally next month. "Joe" said the group was going to continue its efforts. "If we don’t, who’s going to do it?" he asked. "Because in Charlottesville, no one was willing to do it."